With our Serpents and steps game for "Colours" you will be teaching the English vocabulary for the topic Colours. The language you will teach is in the vocabulary list below, and consists of 10 . Snakes and ladders is a classic children's game transposed to the MFL classroom. 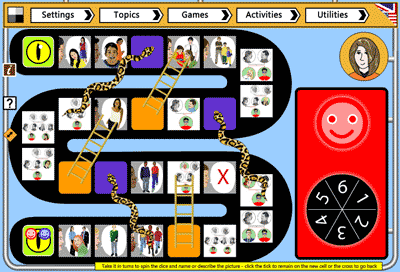 Teams compete by moving their counter along the path avoiding the snakes and climbing the ladders where possible.Serpents and steps is one of 10 FREE whole class games to teach English at iclanguage.com. Text only will show the English label for the topic selected when clicked. Speech only will play the English talk file for the selected topic when clicked. Text and speech will both show the English text and play the speech file.